When you’re reading lots of books, watching lots of films, and also negotiating the thorny business of real life, certain themes can recur in unexpected ways. In the last few months, via two relationships involving very different degrees of emotional engagement, I have been dealing with the subject of parents’ mortality. As things got especially complicated last week, I happened to watch Shubhashish Bhutiani’s Mukti Bhawan, in which a man half-heartedly spends time with his father who wants to die in Benares. I also chanced to read Anees Salim’s new novel The Small-Town Sea, written in the voice of an unnamed boy who is first preparing for a parent’s imminent death and then dealing with its unforeseen aftermath. Parents in these narratives alternate between being guiding spirits, irritants, and reflecting surfaces – mirrors in whose crumbling faces we can see our future and in whose increasingly childlike behaviour we can see our past. Much like his last novel The Blind Lady’s Descendants, Salim’s new book finds matter-of-fact humour in the minutiae of the characters’ lives even while dealing with doomed protagonists and depressing subjects: loneliness and abandonment, the fear of obscurity. The reading process is so full of delights that the essential sadness imbuing the story is only felt with hindsight. Mukti Bhawan similarly weaves wry little moments – a chat about wanting to be reincarnated as a kangaroo, for example – into the fabric of a bleak larger picture. “I will walk alone.” Mukti Bhawan has two mirroring scenes near the end that involve parents, literally, letting go of their children – setting them free to tread their own path. For most of the story, Daya has been emotionally arm-twisting his son Rajiv into keeping him company. But at the end, the father dignifiedly says, okay, it’s time for you to leave now, and quietly watches his departing son. In a slice-of-life film that doesn’t over-emphasize the Big Moments, this scene speaks volumes: it is a second severing of the umbilical cord, and a coming-of-age experience for Rajiv that will in turn help him to be a better, more empathetic parent to his young daughter. Longtime movie buffs know that our cinema has been moving from the mythic mode – built around larger-than-life stories involving archetypal characters – to a more intimate, novelistic one centred on details of individual lives. One offshoot of this is that parents have become a little more human. In many old Hindi films, they were deities to be worshipped (the noble mother) or asuras to be feared (domineering patriarchs), or a combination of both things. Recent films like Mukti Bhawan, the Kannada comedy-drama Thithi (2016) or the more mainstream Piku (2015) and Kapoor & Sons (2016) contain more grounded portrayals of parents becoming children again in their old age, while caregiving children in turn become like parents. This cycle-of-life theme involves many subtle shifts in power equations. 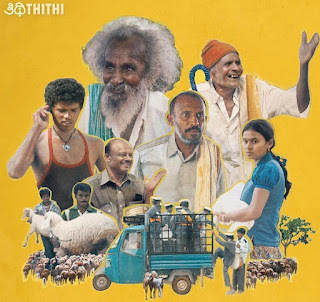 One of the pleasures of watching Thithi, for instance, was that our feelings about the four generations of men in the film kept changing: we realise that the old Gaddappa, shown as an idler with nary a care in the world, quaffing cheap liquor as he ambles through the fields, was once a responsible family man; or that the infant-like 101-year-old Century Gowda (whose death kick-starts the film) may once have been a bullying parent. A memory of a man jumping into a well to save his little son – whom he then raises in the absence of the boy’s mother – is set against the image of the same son decades later, trying to discipline his vagabond father. Similarly, though the Daya we see in Mukti Bhawan is frail, dependent and a loving grandfather, there are fleeting references to a past when he poured cold water on his son’s dreams. 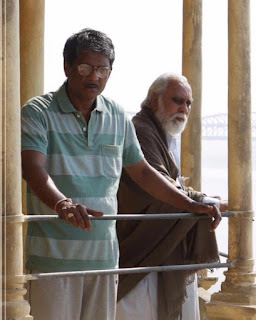 Lalit Behl, who is fabulous in this role, played a different sort of weary patriarch in the 2014 Titli (directed by his real-life son Kanu), a man who sits on the sidelines, seemingly befuddled by the aspirational or violent behaviour of his three sons; near the film’s end, a throwaway scene suggests that some of the family’s capacity for crime flows from his own past, though we get no details. These are all works that examine the many ways in which parents can infect their children’s destinies, for good and for bad. And how, even when they are too enfeebled to be “parent-like”, they can inadvertently teach us just as much about life as when they were fully in control and we were under their thumbs. This column strikes a cord just about now,due to certain events going on personally.The shifting power equation between parents and adult children and the associated frailty and dependancy is something that takes some time getting used to.Have you by any chance seen the movie Love is Strange? The irritability and frustration that the protagonists niece feels was so real to me.